This kit comes complete with all 3 PCBs providing full plugboard functionality. This has been made possible by our Kickstsrter stretch goal being reached. This Kit includes all the Electronic components that are required to make an Enigma similar to the one pictured above. 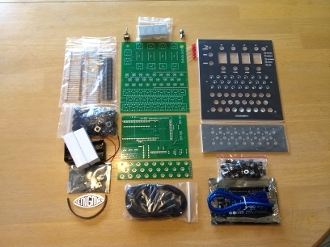 This kit also includes the plugboard front plate, along with 26 Jacks (female connectors), 20 Plugs (2 male connectors per patch jumper, for 10 jumpers like German supplied Enigmas) and over 80 inches of black cloth covered (Steampunk) wire. Refer to picture above to see what an assembled kit could look like. 1 Cloth Covered Wire 80"